The golf course sits amongst high quality residences, with equestrian and sailing facilities also on hand. In the heart of Western Andalucia, Arcos de la Frontera overlooks the most alluring of the pueblo blanco villages and is a gateway to the wonders of this rich and diverse region. 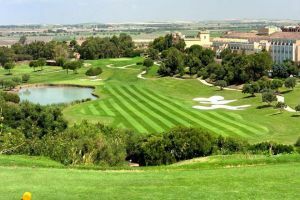 The Landmark Group designed the championship course and it marks the first development by them in Spain. They are known for their world-class golf courses, with five of them being in the top 100. The Arcos Gardens site is quite stunning with 360-degree views over the rolling countryside and the dramatic backdrop of Arcos de la Frontera. As for the course itself, it is versatile enough to challenge even the top-level professionals and amateurs but user friendly enough to allow the handicap golfer to enjoy their round. It does not have to rely on long rough, as strategically located hazards are always in play. The course has wide, forgiving fairways but there is still a premium on accuracy, as bunkers do come in to play to make it an even greater challenge. The greens are of medium size with moderate but not severe contours. The designers have certainly put a lot of thought in to making this a good test of golf, without spoiling the natural contours and superb location.El campo de golf de Arcos Gardens ha sido diseñado de forma versátil, suponiendo un reto tanto para golfistas profesionales como para amateurs de primer nivel, y ofreciendo a la vez un juego afable para los menos experimentados. No se debe de tener en cuenta el trazado del rough para determinar si el campo resulta atractivo para acoger torneos. El campo ofrece amplias calles, con niveles de salida y obstáculos estratégicamente posicionados para proteger sus greenes, que exigen del jugador un drive más preciso. Los greenes son de trazado medio y sus calles onduladas acompañan la pendiente del terreno. El campo ofrece una diversidad de bunkers que crean toda una serie de retos para jugadores con diferentes drive. Close to Cádiz, take the AP-4/E-5 motorway towards Jerez/Sevilla/Paterna and then towards Jerez/Sevilla. Take the exit to Arcos/Jerez Circuito de Velocidad. Close to Jerez de la Frontera, take the A-382 towards Arcos. After passing through the town of Jédula, about 6 kms further on take the exit Arcos-Oeste and you will come to Arcos. As you come to the entrance to Arcos, turn right immediately after the Cepsa petrol station, towards Algar C-344. Bear right at the roundabout, and then follow the road which meanders along, with the cliff face and the old town above you on your left. After passing Restaurante Telescopio, bear left over the bridge, and you will enter the outskirts of the lower town, where you should follow the sign right to Algar. After crossing the metal bridge, turn left up the hill. Approx 1km, at the bottom of the hill, take the turning right towards Algar CA-5221. Follow this road for 3 kms, and on your left you will find Arcos Gardens Golf Club & Country Estate. 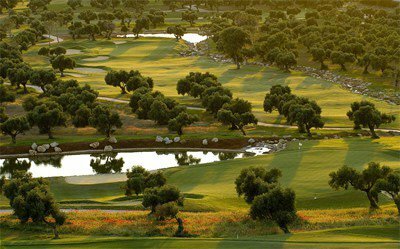 Arcos Gardens Golf Club & Country Estate is not yet in our pool of Golf Courses for orders.